He does have a life outside of basketball. When he’s not coaching, McKillop likes to spend time with his family. He also loves music, enjoys old movies, and treasures his time with his granddaughters. And, believe it or not, he knows all the words to “Con te Partiro” by Andrea Bocelli. He claims to be good at staying in touch with old friends, recognizing his weaknesses, and packing for trips. Traveling is one of his favorite things to do in his time off – especially around Europe. He taught a clinic in Poland last summer and looks forward to seeing Italy and Germany next. He always strives for excellence. 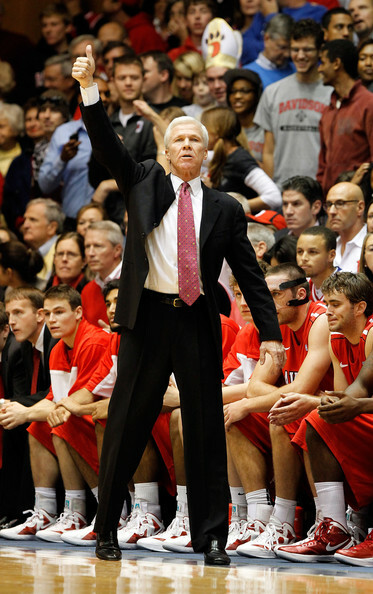 Coach McKillop says one of his favorite things about coaching at Davidson, specifically, is being surrounded by people who are also on a “quest for excellence.” His goal is to pass that drive on to his players as well, by giving them opportunities to be leaders – whether it’s an assignment to communicate on the court or to stand in front of the team and say something to cultivate trust among players and staff. He makes sure his passion doesn’t get in the way of what’s really important, though – over the course of his career, Coach McKillop says he’s gotten much better at gearing his coaching style toward "learning" his players – teaching, educating, and ministering to them – rather than simply satisfying his own quest for excellence. He’s willing to sacrifice fashion for a win. Twenty-five years ago, McKillop coached a game for which his pre-game speech had been about “getting rid of the old.” He ripped his sport coat up the middle and said, “We’re taking off the old and putting on the new.” The gesture didn’t work, and the Wildcats got pounded. You can catch Coach McKillop and the Wildcats in action against George Washington on February 28 at 7pm and against VCU on March 5 at 9pm in Belk Arena. Just your average soul searcher from East Jesus Nowhere, Illinois now studying English at Davidson College. In addition to being a writer, I’m also a cautious adventurer, detail-oriented list maker, slow runner, awkward dancer, novice hiker/backpacker, binge Netflix watcher, avid reader, hopeless Cleveland Indians follower, and passionate postcard sender (and receiver - hint hint).